Wash the rice and soak it in water for 30 min. Drain and cook the rice normally in a rice cooker. Add a dash of ghee while cooking the rice. Clean & devein the prawns. Marinate them with 1/2 tsp turmeric powder and 1/2 tsp salt. Heat oil in a pan and fry the prawns lightly for 3 minutes and keep it aside. Add the fried prawns and fry for 5 to 10 minutes. Add little water if necessary. Add the coconut milk. Now grease the serving dish with little bit of ghee and put a layer of rice. 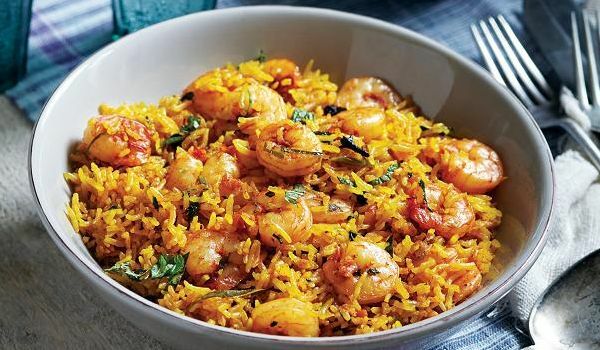 Put a layer of prawn over it and then again rice. Garnish it with fried onions and cilantro leaves. I tried it, easy to make and tastes well. Worth trying. Nice briyani. While reading the recipe itself I can feel the taste. It's so nice.